Any names used in the context has no reference to any real life material. Pozenski Muter and his crew sailed east, returning home from a battle recently won. The seas were boisterous, tossing the ship side to side. The clouds appeared ominous and a flash appeared over the horizon. Pozenski felt cold and alone as his vision blacked out on him. "Is everyone here?!" He shouted. "Who's hurt?!" "I'm fine!" and "I'm okay!" were his sure signs of having some company. The crew looked for a way back into the cabins. A few were screaming, they must have been thrown overboard. Pozenski shook his head and drowned out the panicked screams with his desparation to get back inside. He made it to the door and found out it was locked! Pozenski flew into the air, grabbing a plank beforehand, and was a speeding projectile into the abyss. Of all the luck, the rain slowed into a drizzle... then stopped. The sun shone through and the ship was out of sight. Pozenski couldn't find anyone else. He held onto the wooden plank and slowly waited for his death. Out in the distance, a foreign ship was headed over... what were the odds of that? As the boat was nearing towards him, he hoped for someone on the portside to see notice him. And if the chances of coincidences weren't enough, someone was looking out into the distance before he noticed that something strange was happening below him. The crewmembers threw out a rope to Pozenski and helped him up. The ship was apparently headed towards a city called Lyrutia (Ly-roo-shuh). Pozenski has never heard of it, but it was better than dying slowly from lack of oxygen, food, and strength. The sky was completely clear, all but the sun, and the path towards Lyrutia seemed heavenly as the seas calmed down as well. Whatever happened was fated to have Pozenski fall into the abyssal mouth of the ocean, then saved by a passing ship that could have been anywhere in the world. This is a really late update, but I got rid of the overview map in the ZIP file. It was completely unnecessary. I just wished that the workers would take from the stockpile nearest to them... . But the map looks really cool! A quite good freebuild map you've made there, but there are a few things, which make this beauty unplayable. There's not a lot of place to build, and do anything on the map, but I don't count that in. The main problem here is with the key "F1". 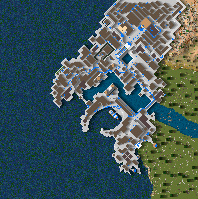 If I want to make an invasion to test the castle(or jsut destroy it to the ground for fun), the enemies don'T even try to attack, and the reason is: after the gatehouse is destroyed, they can't go up in the castle, as the whole city has a higher elevation and only the walls connected it with the gate. But since it is only an eye-candy map, and it is supposed to only look at it, I give a strong 4 here. This category should really be removed from here, or a new folder shall be opened for Stronghold: Eyecandy maps. Personally I woudln't rate this category in this map as this map is an eye-candy map, but for the mentioned reasons in playability I give it a 4 only. Brilliant! I have to say, you did a great job with this map, the idea is very good and the usage of fantasy names and the story shows me that you are very creative. This map is almost outstandind, the city simply looks awesome, I especially liked the keep area and the stairs leading there. The boat also looks very good and what I really like in this map that it lives: Everyone is working, doing their duties, the soldiers are guarding the walls, soem soldiers are on the boat, like they are ready to sail to the Holy land for a Crusade. The atmosphere of the map is fantastic. The only thing why the score is not a straight 5 is the area surrounding the castle, it just doesn't looks very spectacular or natural. From what I've experienced with the F1 invasions, the soldiers generally move up towards the max-plain area and destroy the walls there.